Today I focused on not focusing on flying the PTS manuevers, if that makes any sense. That strategy of not over-thinking things worked out, and I believe my performance would have satisified the examiner. Today's ground track. The loops are clearing turns and 45 degree steep turns. There are always a few squawks, though. The afternoon thermal bumps did make heading control difficult during slow flight. Those convection currents also slowly carried the airplane above my stated altitude and I didn't correct quickly enough. I had been trying to keep my head out of the airplane--maintaining level attitude visually--but I still need to keep the instrument scan going to keep tabs on the altimeter. I let the airspeed get a little low during the forward slip portion of my simulated emergency landing (got to get that nose down), and I came in a little bit hot and high on a short field landing. 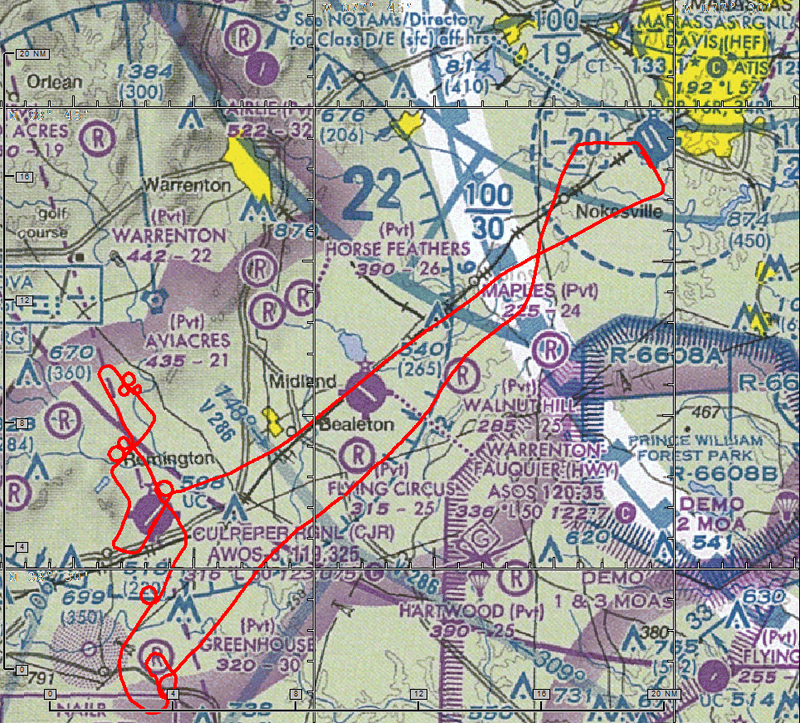 During the test, I would have aborted that approach but it was time to put the plane away. I'm trying to move quicker in all activities (preflight, startup, setup for the maneuvers, shutdown, etc.) while still being just as thorough. I have all of the checklists memorized, so I do the steps, then look at the checklist to make sure I haven't missed anything. I definitely feel more confident in my flying, and I am slowly realizing that exhibiting real confidence is a big part of the practical test. My goal is be ready for the practical test after tomorrow's practice session and the subsequent stage check re-take. I might also throw a solo practice flight in there, weather permitting. I have some economic realities to face if that doesn't prove true. I've certainly tried to make good use of my available funds by preparing thoroughly--sometimes getting to the airport two hours ahead of time and you wouldn't believe how many flying books I've read and quizzes I've taken--but once the propeller turning, the pressure is on to get proficient fast. It costs almost $3 per minute with a CFI in the right seat and that Lycoming O-320 engine running. Looking at my total hours, I've officially exceeded my school's average time of 55 hours to earn a Private Pilot certificate. I made peace with the fact that I am below average by that metric ("well, the world needs ditch diggers, too" comes immediately to mind).